A little over a year ago Mike Monti, Business and Operations Manager at Warminster, PA-based ecoFINISH™ also wore the hat of product blender, manually loading 160 pounds of raw polymer powder into a 55-gallon rotary drum mixer to blend color recipes for the company’s unique thermal spray coating, aquaBRIGHT™. The coating for swimming pools and spas resists chipping, peeling and scratching. The company manufactures both the materials and equipment used to apply the fast-curing, durable eco-friendly thermoplastic coating to fiberglass, aluminum, and existing masonry finishes. Scooping 5 pounds at a time, “32 back-breaking scoops,” says Monti, was time intensive and created dust which each scoop. When nearing the bottom of the drum, the reach inside the drum to retrieve the remaining product required long arms and standing on his toes. After the product was blended the process began again, scooping blended product into 40-pound boxes, which didn’t create the same amount of dust as loading but still required body contortions to get the last bit of material from the bottom of the drum. After several years of building a strong industry presence and global distribution channels, it was time to invest in a blender and bulk materials handling equipment. Monti began researching vacuum loading systems when he came across Belleville, NJ-based, VAC-U-MAX. 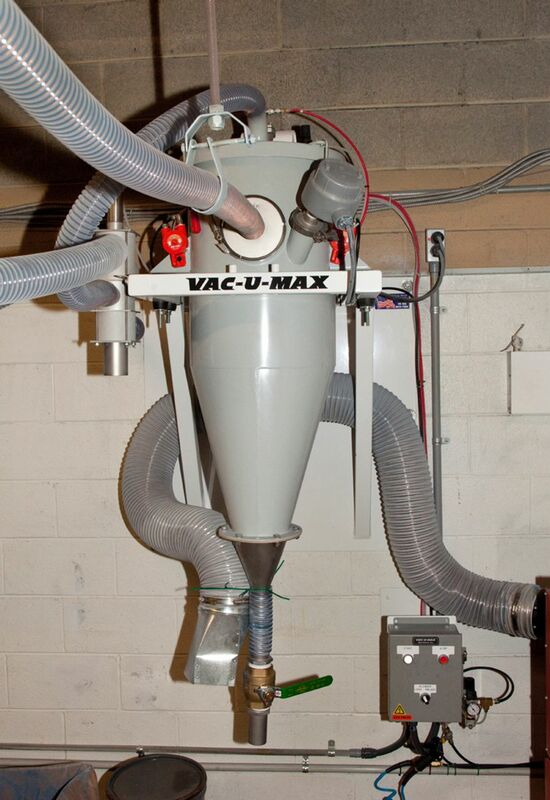 Specializing in the design and manufacture of pneumatic systems and support equipment for the conveying, weighing, and batching of dry materials, VAC-U-MAX has a unique adaptation of vacuum transfer called "direct charge blender loading”, designed specifically for the direct charge loading of blenders, mixers, reactors and any vessel capable of withstanding a vacuum. With a facility’s blender or mixer as the primary receiver, the conveyor manufacturer configures systems specific to each application, providing the power source, filters, controls and blender covers with product inlet and vacuum outlet. In addition to loading the blender, ecoFINISH™ also needed a way to get the blended product from the blender and into packages within a specific budget. Rather than purchasing two vacuum conveying systems, the conveyor manufacturer suggested a dual-purpose system that uses the same conveyor system to load and unload the blender. Power options for blender loading vacuum conveyors include vacuum pump packages from 3hp and higher as well as the company’s exclusive venturi power unit available in single to quadruple venturi versions. Direct charge blender loading systems standardly convey up to 7000 pounds per hour and when they exceed that rate, systems are equipped with increased levels of automation. Before purchasing the equipment, ecoFINISH™ sent samples of its materials to the conveyor manufacturer to test, free of charge, The fully functional state-of-the-art 6,000-square foot test and demonstration facility is equipped to conduct a plethora of vacuum conveying trials to simulate the actual conditions at a customer's site. Using standard equipment , the conveyor manufacturer configures systems specific to each application and its direct charge blender loading systems come with the option of either floor standing or suspended blender loaders designed to significantly reduce the amount of carry over, eliminating product loss. Carry over is the amount of product collected in the filter separator during the loading process that separates the air from solids (dust) inside the vessel to prevent solids from reaching the vacuum pump. The advantage of floor-standing units is that they are readily accessible for cleaning and can be equipped with casters, allowing them to service more than one blender. With floor standing units, once the blender is loaded and equalized, carry over releases into an airtight vessel that preserves product integrity allowing for re-use or safe disposal. Because the system pulls the powder pneumatically from the drums into the blender, there is no longer any dust released into the environment during the process. After the materials are blended, the same vacuum conveying system used to load the blender is connected to the bottom of the blender and material is metered by volume into a collection hopper. When it reaches a predetermined level, the system stops conveying and dumps the material into a box. Now, instead of scooping it out 40 pounds at a time, ecoFINISH™ only has to make small adjustments if the box is heavy or light before sealing the box. “We can now run 25 boxes at one time. When we get busy, like we have been this week, and an order comes in for 21 boxes, if isn’t already on the shelves we can have it ready to go the next day,” says Monti. “The need to mix more at one time was the driving force behind getting the large blender; and, the VAC-U-MAX dual-purpose system makes the process more ergonomic, less physically taxing and cleaner. It is a simple system that drastically changed things for the better,” he says.